Home / Editor's Choice, Entertainment News, Featured Articles, Gossip and Drama, News, Politics / Here’s the message that SHARON sent to OBADO’s eldest son, this LADY was merciless and notorious extortionist. Here’s the message that SHARON sent to OBADO’s eldest son, this LADY was merciless and notorious extortionist. 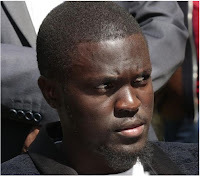 Friday, September 14, 2018 - The late Sharon Otieno started blackmailing Migori Governor, Okoth Obado, after their affair flopped. Obado was forced to cut communication with the late Sharon and block her calls after she started making crazy demands. One of the things that Sharon demanded from Obado was a Ksh 35 million house in Westlands. The Governor was ready to buy her a Ksh 10 million apartment in Nairobi but she insisted on the Ksh 35 million house. When Obado got fed up with Sharon’s demands, he cut off communication and this is when real trouble started. According to Obado’s statement to detectives in Kisumu, the young lady started humiliating him. At one time, she sent a photo of her baby bump to Obado’s eldest son on WhatsApp. Sharon died a week ago after she was kidnapped, tortured and her body dumped in the forest.